A good electric knife is more efficient than a traditional one, and it makes the process of prepping your foods quicker, easier and more enjoyable. If you are fed up with all your dull knives ending up shredding the chicken every single time or just simply want to save time while cooking, you should consider having an electric knife in your kitchen. The question is how to find the best electric knife for your needs. Electric Knife - What Is It? What To Look For When Purchasing An Electric Knife? An electric knife is a tool that takes the heavy lifting out of slicing, carving and chopping your m﻿﻿eat﻿﻿s and ﻿﻿vegetables. There are different types of electric kitchen knives, and you can choose a knife that uses batteries or runs off a power cord. Electric knives are mostly sold during Thanksgiving when turkey meat needs to be sliced perfectly. 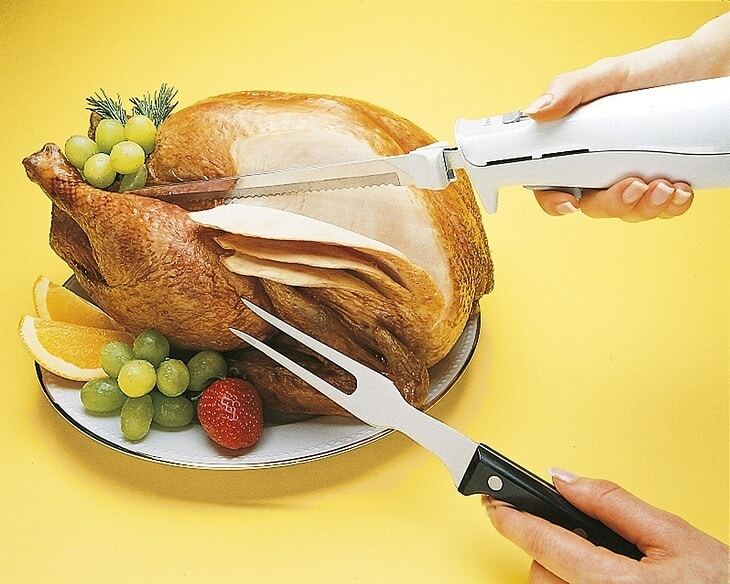 Beside turkey, a electric knife can work really well on tender meat and bread. Plus, they are very safe to use. The blade itself is typically removable, which makes it easier to clean. Electric knives can also make it possible for you to perform cooking tasks that might otherwise be too painful to complete due to arthritis or other health conditions. No matter what type of slicing you need to do, there are a few basic criteria you need to keep in mind when purchasing an electric knife. The length, material, safety features and ergonomics are all important factors. Electric knives are available for nearly any task, and you'll need to carefully evaluate your options and think about how you intend to use the knife. As you might expect, electric knives come in several different sizes. The biggest knife isn't going to be the best option for most tasks. Turkey, chicken and r﻿﻿oast beef﻿﻿ will require the larger knife with blade in the range of 9 to 10 inches long. Keep in mind that the longer your knife is, the more different types of meat you can slice. However, process of filleting a fish requires a smaller electric knife that is capable of getting around the tissue to perform small cuts. You'll want to choose a small knife for fish. When you need to fillet a fish, a electric fillet knife could help you to do it with ease. Take a look here. 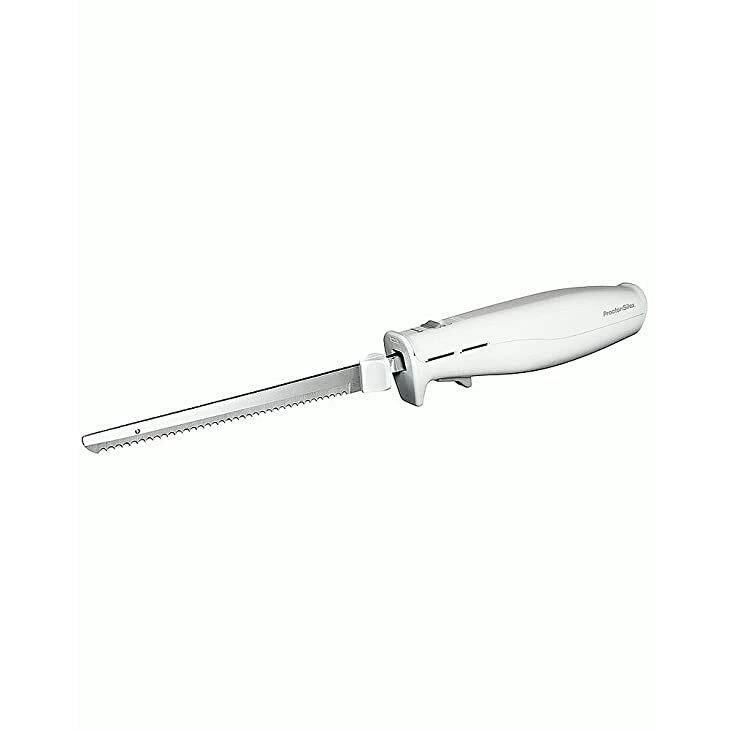 Stainless steel is a basic requirement for any electric knife. If the blade isn't made of stainless steel, just keep looking. You may be able to find some that are made out of synthetic material, but these won't have the same level of durability. The blade won't corrode, rust or tarnish over time. Stainless steel is also extremely easy to clean. The knife can be sharpened more easily. There are a host of safety features that are available to help ensure you get a quality product that won't injure you. The best safety feature is you since you're the one who has to make sure you don't injure yourself or others. However, you can't always watch the knife to make sure your children don't get hurt. Look for a knife that has a locking or double trigger. This can make it more difficult for children to accidentally turn on the knife. It's also important to store an electric knife in a safe place where it can't be dropped or accessed easily. An electric knife should be sharp. But, if you're cutting foods like tomatoes and fish, you're also going to need a sharp with a lot of precision. A knife sharpener will be what you looking for when it come to refining your electric knife blade. A knife that doesn't have a steady rotation of the blade won't be able to cut evenly spaced slices of bread, and it will turn your hard cheeses into a muddled mess. You need to consider the type of food you'll need to cut and choose an electric knife that fits those specific needs. Many electric knives come with removable blades so you can easily change the blade for the task at hand. The precision is largely determined by the rate at which the blade moves back and forth. The faster the blade, the more precisely it will cut. The ergonomics of a knife can make the difference in whether or not you actually end up using your new electric knife. A heavy knife might be okay for cutting a large roast beef, but it will become tiresome if you're trying to cut vegetables and smaller foods. You'll need to choose a knife that works for you. The knife needs to fit comfortably in your hand. It should be light enough for easy maneuver. Avoid a knife that is overly weighty for the task at hand. It offers a hand-contoured grip. Vinyl, silicone and rubber materials make the best hand grips. If you're left-handed, that is another consideration. Most electric knife blades are removable, so another thing you should consider is that can you find replacement blades if you have to. Using a power supply to keep your electric knife working may not be the most convenient option. You won't be able to take the knife with you, and the cord can cause a safety hazard when you're moving around the kitchen. However, if you need an electric knife that is powerful, you may have to choose a knife that plugs into a power supply. The other option is a battery-powered knife. This type of knife can be carried with you, and it does make the device more portable.The charging process can range from a few hours to an entire night before it's ready to use. Still, it offers a good balance between portability and power. If you never leave the kitchen, a knife that operates off a power supply may be your best option. 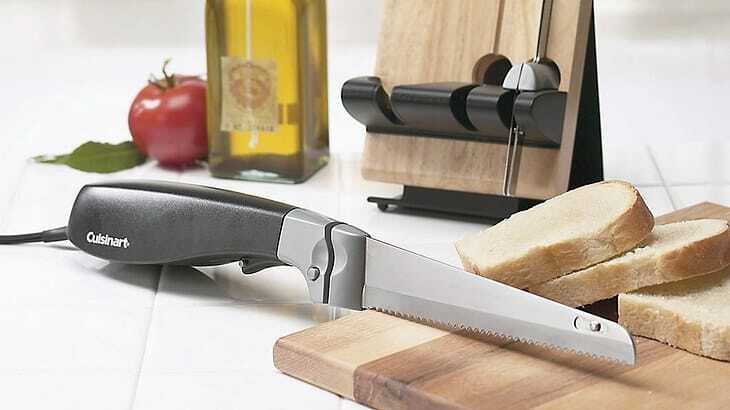 When it comes to slicing any type of meat and filleting a fish, this knife simply can't be beat. It features a powerful motor that is able to provide outstanding torque. It uses a powerful blade action that is able to provide a consistent cut every time. The ergonomic design is a welcome addition, and it can help prevent fatigue when cutting for an extended period of time. This electric knife also comes with five different blades so you can manage any job with a single tool. The largest blade is a heavy-duty 10-inch blade while the smallest is a 5.5-inch blade. It also comes with a carrying case and a glove. It comes with several different attachments. It's a powerful knife that won't jam or slow down. It comes with an ergonomic handle to reduce fatigue. It includes five blades for the ultimate in utility. The included carrying bag will protect the blades from corrosion buildup. A glove is included for safety and comfort. The knife requires a power outlet. The knife is on the heavier side. We love this knife because it fulfills all of the criteria that we expect from a knife. It has a fast blade, comes with a compact storage space, and effortlessly carves through bread, roasts, ham, turkey and vegetables. It comes with an 8-inch serrated blade, and the fork is 10.5 inches. The fork is also dishwasher-safe, but you'll want to hand-wash the blade. The knife is fairly lightweight for such a big knife, and it comes in at just 2.6 pounds. It also rests easily in the hand, and it uses two serrated blades to cut just the right thickness for your favorite foods. This knife won't work for filleting a fish, but you can cut just about anything else with this blade. The electric knife is lightweight and easy to hold. Serrated blades make it easy to get a perfect cut every time. The blade and fork are both made from stainless steel. The knife must be connected to a power supply. The blades need to be washed by hand. The grip on the electric knife isn't very ergonomic. The Proctor Silex Stainless Steel Electric Knife is capable of cutting through all types of meats, and it can also cut bread evenly. There are two stainless steel blades that are durable and long-lasting. 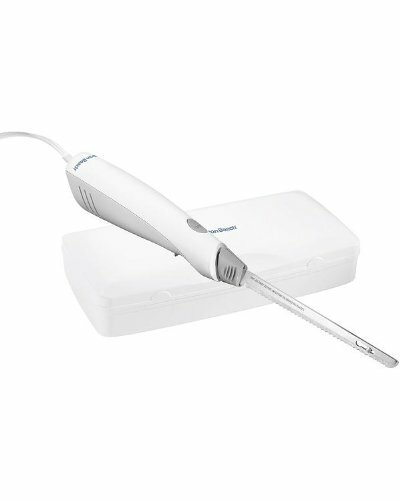 The unit must be connected via a cord, but it's very lightweight and easy to use. It has a one-touch button control to make it easy to cut, and both left- and right-handed people will enjoy using this electric knife. The handle is made with vinyl for extra comfort and stability. The blades are also dishwasher safe, which makes it easy to clean up after your event. This knife is great for slicing through any ﻿﻿﻿﻿﻿vegetable or fruit as well, and pineapple is no match for its power and speed. 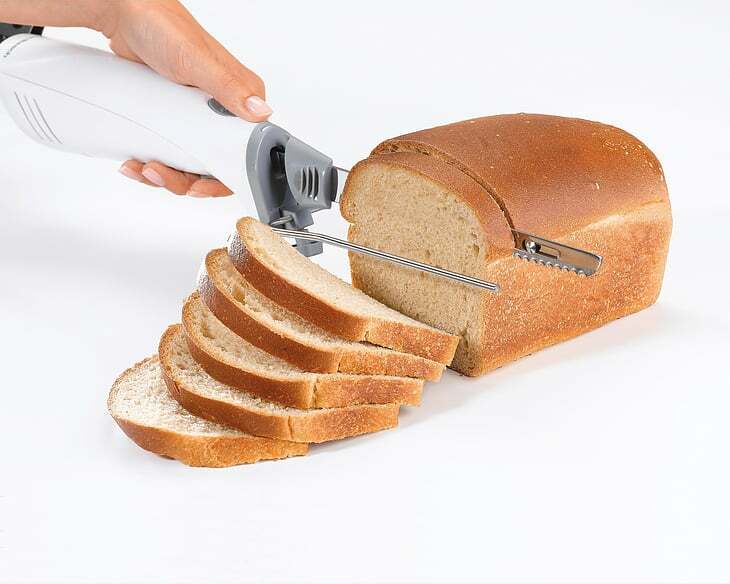 You'll be able to save time cutting bread since the knife is designed to cut single and multiple slices of bread. 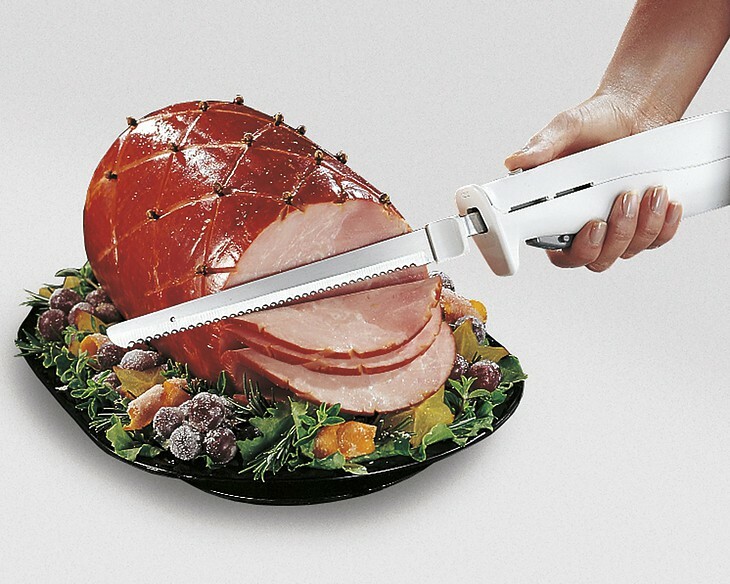 The fast blade is able to easily cut through meats. It's ideal for cutting soft or hard bread without crushing. The knife offers a hand-contoured grip for comfort and stability. It's lightweight and the blade is less than two pounds. The knife requires a power source. It doesn't come with a storage case. The knife is missing some basic safety features. It doesn't provide multiple blade options. Cuisinart is a name we trust, as this company continually produces high-quality products for the home cook. This knife is made of brilliant stainless steel, and it can be placed in the washer for easy cleaning. It comes with a traditional and quaint wood block storage tray so that you can proudly display it. The tray also provides a safety lock to make it difficult for children to get their hands on the knife. 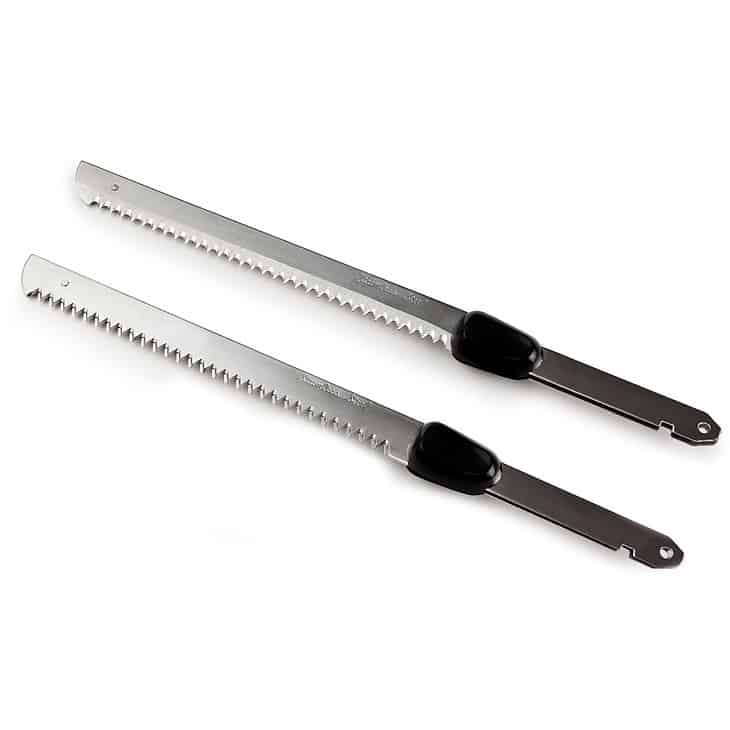 There are two separate blades for carving bread and meats. This knife is comfortable to hold and easy to use, and it boasts a simple design that won't disappoint. It's also designed so that both left- and right-handed people can use it. The blades are fast and provide a precision cut that will make short work of any food you need to slice. This electric knife is not battery-powered, but it's great for any kitchen. The left- and right-handed ergonomic design makes it easy to hold. Stainless steel blades provide excellent durability. The knife includes a one-touch, pressure-activated power switch. A safety lock is included. The knife is not portable. The knife is a mid-range electric knife, but it's not the most powerful. It may not be suitable for thick meats. Sometimes the simplest design provides the most utility. This is the case with the Hamilton Beach electric knife. It has a multipurpose blade that is suitable for cutting a range of foods, and it is an exceptionally durable knife for its price range. The knife feels sturdy in the hand, and many customers have enjoyed more than a decade of use out of this versatile tool. It has a storage case that helps to save some space. The bread guide makes it possible to cut perfect slices every time, and the electric knife is powerful enough for carving and slicing. You won't be cutting through dense bone with this knife, but it's more than capable of handling your Thanksgiving dinner for years to come. It's also an extremely lightweight knife, which makes it easy to use and maneuver. 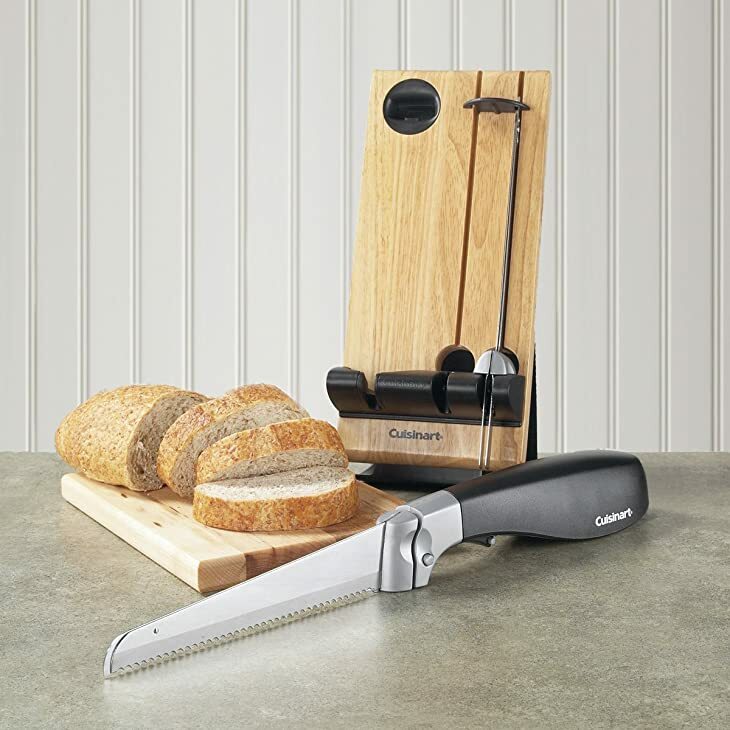 It's ideal for carving meats and slicing bread. Guides make it easier to cut perfect bread slices. The storage case is compact and saves room. This durable item will last you for years. The simple design makes it easy to operate. The blade is only 7 inches. The knife may not be suitable for people with large or very small hands. The knife is lacking safety features. 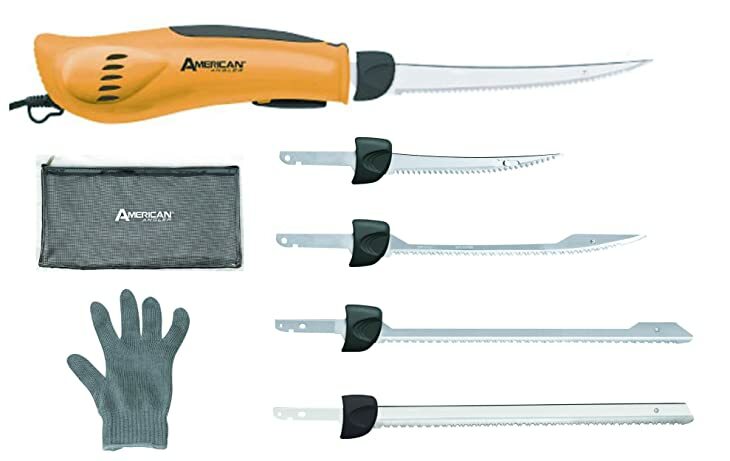 The clear winner of our lineup is the American Angler Pro Electric Fillet Knife. It offers everything you could want in an electric knife. It comes with a carrying case, a glove and several knife options. Powerful motor and enough torque to handle any task. Ergonomic handle which make it easy to hold. It comes with one of the longest blades we've seen in an electric knife. It also has a knife that is ideal for filleting a fish. You can use it for light and small jobs, and it's quite likely the only electric knife you'll ever need. While many of the knives in this lineup are high-quality knives, they can't compete with the ﻿American Angler Pro. What about you? Have you used any of these knives? Do you have any experience you'd like to share? Tell us what you think or ask me questions by commenting below. Share this article if you found it useful.